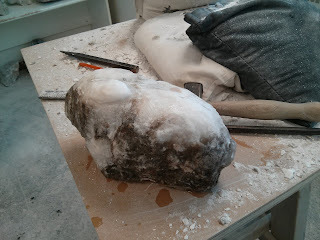 The starting point - a 7 or 8 pound chunk of alabaster. As I've said before, I have a thing about skills. 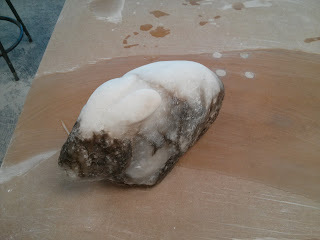 So when I was browsing the catalog for a local art program and found a stone carving class I jumped at the opportunity. It seemed like an interesting thing to know and, since I like to work with my hands, something that maybe I would enjoy. The class was one day, and you start with a piece of white alabaster and end with...something. What you make and how far you get is up to you and the stone. Our instructor, Scott, showed us the tools and how to use them, and then let us go at our own pace. He pointed out that once everyone got going, the sound of the hammers on the chisels was almost musical, and it was. It was like meditating. I was so focused on my sculpture that the hours just slipped by. The tools are simple and haven't changed much for millennia. A steel point, a toothed chisel, a flat chisel, a small hammer, rasps, files, and sandpaper. I listed them in order of use, in a way. The steel point is what you use to take off larger chunks, then the toothed chisel smooths that down and then the smooth chisel takes out the marks and refines it further. Scott said your tool should take out the marks of the previous tool. He asked us to pick up a stone that called to us. I picked up one that felt good in my hands but then I looked and looked and couldn't come up with something hiding in it that I could unlock. So I went and got a different stone and felt that maybe I could make a bunny. Since we got Mocha, I've had bunnies on my brain, I guess. You draw out the shape on the stone with a charcoal pencil and then start working. Sandbags hold the stone so it doesn't wiggle and you can periodically spray the stone with water to keep the dust down and see what you're doing. 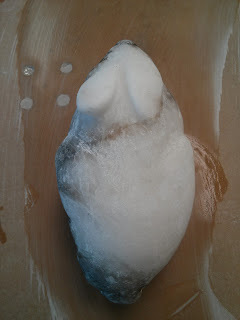 By the lunch break, the shape was recognizable. Alabaster is a calcium based rock, and is fairly soft in the grand scheme of things. Our instructor likes working with it for teaching partly because since it isn't a silicate we don't have to wear particulate masks. It's also easy to work with but, as I found out, it can break fairly easily as well. Chip, chip, chip. It's an iterative process. You chip a bit, you redraw your shape, maybe you file a little to see where you're going, and chip again. I brought down the rock to a more symmetric shape but was stymied a little by a natural hollow on one side which was supposed to be one of the haunches of the bunny. There was also a lot of dirt in the rock which changed the color; fortunately the color worked to my advantage on the head where the pattern was similar to a Dutch rabbit. After puzzling over it for a while, Scott suggested I leave part of it raw and see how it looked. 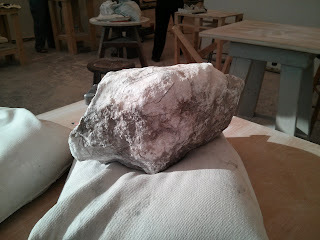 I think it worked well but if I had more time I might have made the whole thing smaller to have less raw stone. The trickiest part was the ear that I wanted elevated off the back; twice I had it where I wanted it, only to have the tip break off and then I had to bring both ears smaller to fix it. Once the chiseling is done the rasp and file are used for some of the finer detail and smoothing. 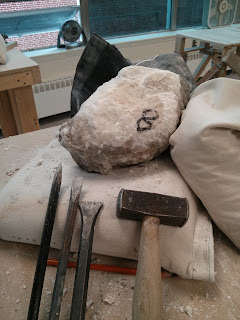 Ultimately, every little defect in the stone should be smoothed out before sanding or it becomes more glaringly obvious as you sand with finer and finer paper. I think I filed for about an hour before I felt I was ready to sand; given the irregularities in the surface I could have clearly filed for much longer. Sanding starts with coarser paper and moves to finer and finer papers, starting at 150 and ending at 1500. After the first few sandings, wet the stone and the paper and use the stone dust as part of the sanding process. When it's all done, it gets waxed with 3 coats of butchers wax. We did not get to that step. I only got as far as 600 sandpaper. As finished as it was going to get, for now. All in all, it is something I think I would do again. It doesn't require fancy equipment or dedicated space (although Scott's studio was nice and had a lot of natural light). I can see myself in the backyard in the summer working on a project and taking my time with it. I found it very peaceful. That's really good! I love the colors in it!